As humans, we are often quick to quibble over things we feel are important to us when others don't share our enthusiasm — especially food, holidays, and special events. This problem is often more a sign of insecurity than it is a mark of sincerity. We are to do what we do based on our commitment to honor the Lord, not because others do it or approve of it. At the same time, we want to be careful about judging others for what they do or do not celebrate, eat, or drink. 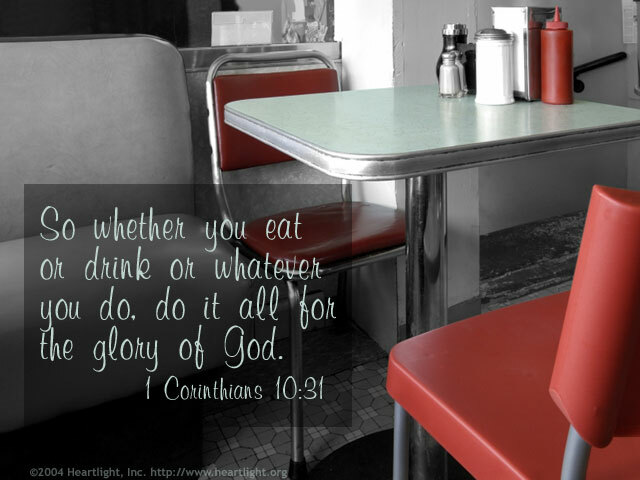 The bottom line when judging such things: Can we do it to honor the Lord? Holy and Righteous Father, forgive my foolishness and silliness. I find myself getting so worked up over meaningless things and forgetting to keep my focus on the matters and people that are important to you. May all I do today, and every day, be done as a conscious decision to honor you and bring you respect. In Jesus' name I pray. Amen.